Golf Wales: Twenty Ten Course. 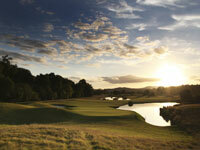 Built to stage the 2010 Ryder Cup, the course opened for play in July 2007. The first course to be built specifically for golf's greatest team tournament, it measures a robust 7,493 yards off the back tees and has a par of 71.